Since this mod is really just super simple and all it does is add a single banner that comes with skyrim to one cell, there really isn't any need to seek permission. Someone could recreate this mod from scratch in just a few minutes. But if you do decide to run with this idea and produce a better product, please let me know, so I can check it out. hoax2 - while I did not use any of his assets, the idea came from his mod. I first must give credit to hoax2 for thier Custom Sigils DIY mod, which is what prompted me to make this mod for skyrim. 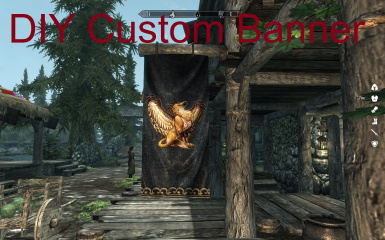 This is a very simple mod that is meant to be used by people that would like to put a custom banner into the game but don't want to play around with the CK and do it themselves. 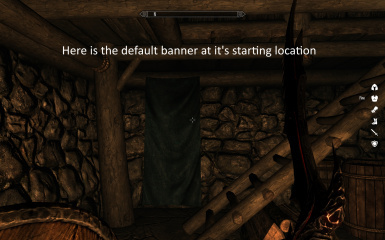 This mod puts a copy of one of the generic banners from skyrim in your data folder that can be edited and customized without changing any of the existing banners in the game. To copy or move the banner you will need a program like Jaxonz Positioner. These are things I would like to do , but due to lack of time they probably won't happen.